Becoming a better man one step at a time. YOU CAN’T KILL THE BEAST ON YOUR OWN. You can’t become a better man on your own. It is impossible. You may think you have your sins under control, and you don’t need help to change but what a lie to fall into! Men, you cannot beat your sins on your own! Our sins are like a wild beast inside us. The more we hide them and try to control them on our own, the larger the beast becomes. We need to release the beast out in public and kill it in the street. And there must be witnesses! This is where the other men come in. We need to surround ourselves with other men we can trust and be accountable to. Other men we can lean on, and be completely vulnerable with. Other men that know our beast and are rolling in the street with us trying to defeat it. I’m talking about real men, like you and I, that have the same struggles and are trying to become better. Get together once a week/month and just get real. If you’re reading this blog and are on the journey to become a better man, and you don’t have men in your life like this, it’s time to find some. I am in the process of creating this type of group of men for myself and couldn’t be more excited. So grab some men and get down to business, because you can’t kill the beast on your own. Lay it all down Men. Time to live free. 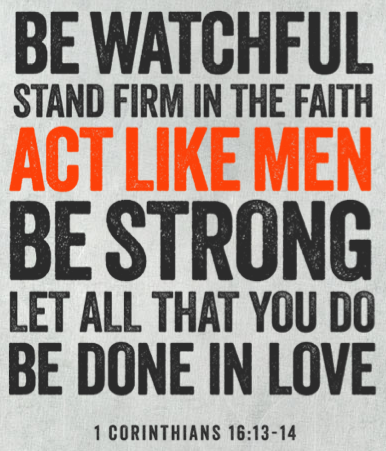 The Act Like Men Conference I attended this past weekend was a game changer. In a world where our culture encourages us from childhood to climb up the ladder of success, income, fame and popularity, it’s hard to be the humble man and not get left behind. The western world has completely adopted this vision of individualism. People nowadays are only worried about numero uno, and living for themselves before others.You often hear of people leaving their families to travel the world and ” find themselves, ” trying to figure out their purpose, or meaning. In the working world people will do whatever it takes to get to the top, no matter what or who they hurt along the way as long as they reach success. And once they are there they feel this pride over others that haven’t made it yet. They worked hard to get there, all on their own and they deserve it. But do we deserve it? Do we deserve anything? All those examples I used are examples of myself. I do and think all those things, and now it’s my journey to learn to think differently. We need to be conscious of our thoughts and catch them as they arise. We need to see others as better than ourselves so we can become the ultimate servant. It won’t be easy and it will definitely take time, but I think over time we will be able to change our mindset and in turn transform our hearts. Try and think of your own examples of times you think yourself better than others. And then think of those people as better than you. Become the ultimate servant. Humble yourselves. Everything you have, came from God and you didn’t acquire any of it on your own. Wherever you are on the success or income ladder isn’t because of your hard work. Whatever popularity or fame you have, came from God. And the sooner we understand that the sooner we can start our journey working towards being completely humble in all ways of our life. Trying to live as one in this world, instead of one of this world is not easy. We can easily get caught up in our busy earthly lives and schedules. Our plans for our future on this earth, what we’re going to buy next, or how we’re going to remodel. None of it matters. My wife and I are going through our third renovation in our century home. We did the first floor when we moved in, 3 years later we completed the second, and now we’re doing our kitchen. Renovating old houses in our neighborhood is very popular, everyone is doing it. But I feel so conflicted. Yes our house was a rental/student house and a bit of a disaster, so it definitely needed some help. And it will be beautiful when it’s finished. But at the same time, I don’t want to spend all our time and energy making our “home” on earth perfect, when it really doesn’t matter at all. Yes, it’s where we’re living now, and just because we won’t be here for eternity, doesn’t mean we should go live in the dump until then. But I just don’t want to get attached. Believe me, I want our house fully renovated and finished as much as my wife, maybe more (so there’s no more work to do!) But, when it’s done, I want to try to have my main focus on the future. I want to learn to not want, and to be content with what I have. It’s so easy in the western world to fall into wanting and attaining everything, because it’s so easy to get whatever we want, whether we have the money or not. Materialism is a very dangerous monster, and it’s being thrown at us everyday, on the radio, T.V., movies, magazines. Now I have done my fair share of wanting and having. From the latest electronics, video games, newest cell phones, to pimping out cars. But I think I have a pretty good handle on it now, but it is a daily struggle. Just the other day I switched our cell phone plans to a much much better deal, way more options for much less money, good right? After it was all switched, I almost asked if they had any deals on phones so I could get the new blackberry. Why?! Oh right, because everyone has it and I want it too. Good news is, I didn’t ask! All this crap we obtain on this earth is all trash and will fade away with this earth. It is the treasures in heaven that we need to focus on and bringing the good news to the people of this world. Now I’m not saying we can’t or shouldn’t have nice things in this world. If my phone breaks, or stops functioning properly, I’m not just going to say ” Oh well! ” and toss it. I will need to buy a new one, and I will. But I’m not going to wait in line for the newest iPhone so I can have the first one, and pay an insane amount of money for something smaller than my hand. We need to control our wants, and turn them into needs. Plain and simple. Sure, we’re human and 99% of us will never be able to completely rid ourselves of our want. And that’s OK. If you really want something, and have worked hard for it, and saved for it, I don’t think there is anything wrong with obtaining that item, no matter what it is. Just remember the bigger picture. Try to remember that this week as you watch T.V. or walk through the mall. Or as you’re sitting with your wife after a nice dinner, planning your future. What is it you want in this life? Plan it all out as one of this world would. And then when you’re done, and you’ve planned your life, all the way to what you’re going to do with your retirement, ask each other how much of that aligns with God’s plan for you. Now change your plans. You may be up all night. Learn to do good deeds with no strings attached, or rewards in mind, besides the reward of other’s happiness. Try to learn to desire making others happy over making yourself happy. This is not to say to put your own happiness on the back burner and focus solely on other’s happiness. But to have a servant’s heart, so when you do good deeds and make others happy, it makes you happy. Practice this until it becomes who you are. Thanks for checking out the Blog! Follow via e-mail or Twitter and let's start to become better men together. One step at a time.